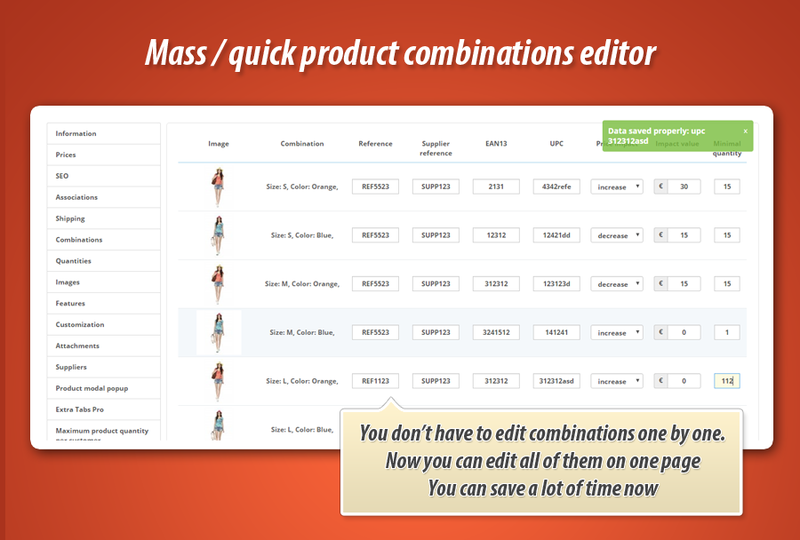 If you spend a lot of time on editing process of combinations in your shop - this mass edit module will help you. 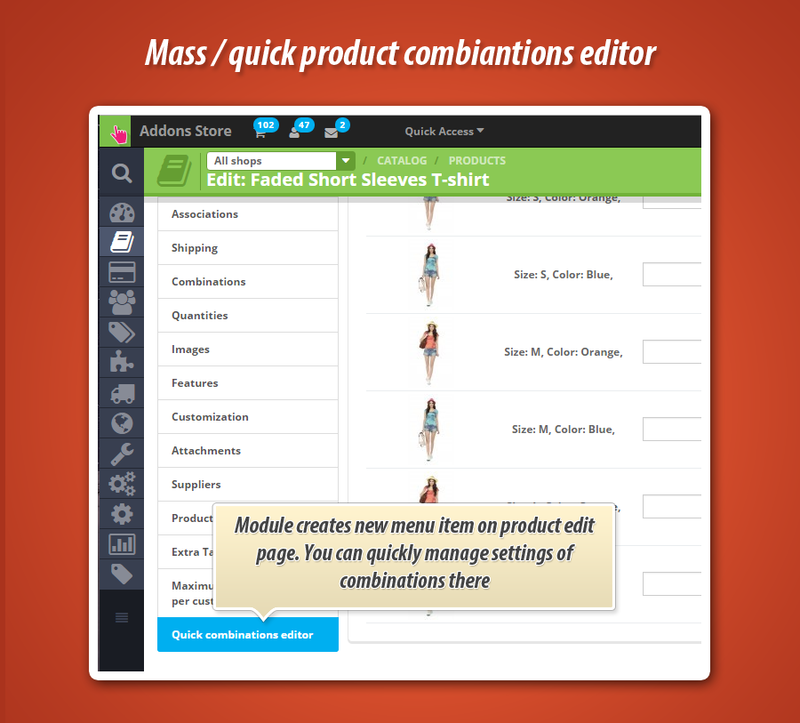 With this PrestaShop addon you can equickly manage product combinations from one page. 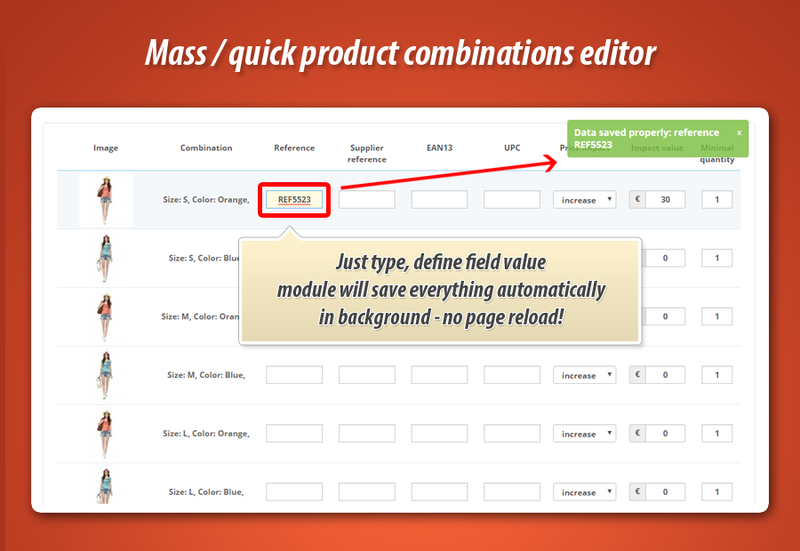 You can save a lot of time with this mass combinations modification plugin. 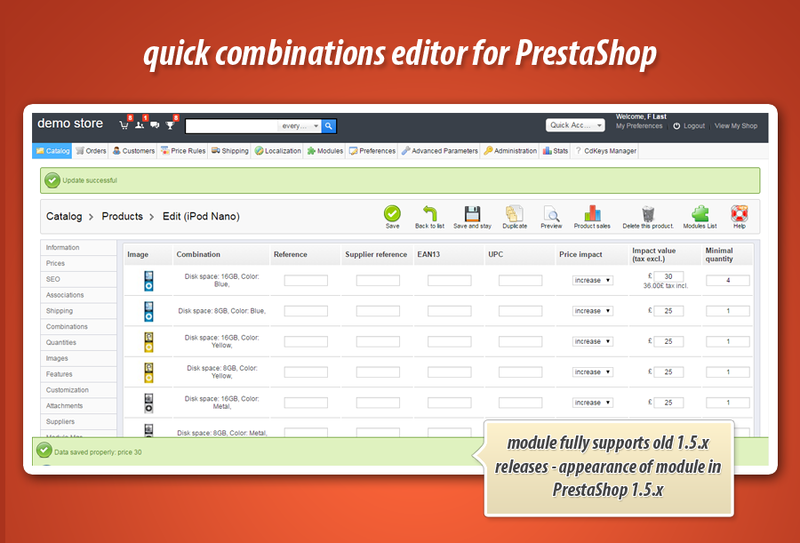 With this addon for PrestaShop you can quickly edit combinations of products in your shop. 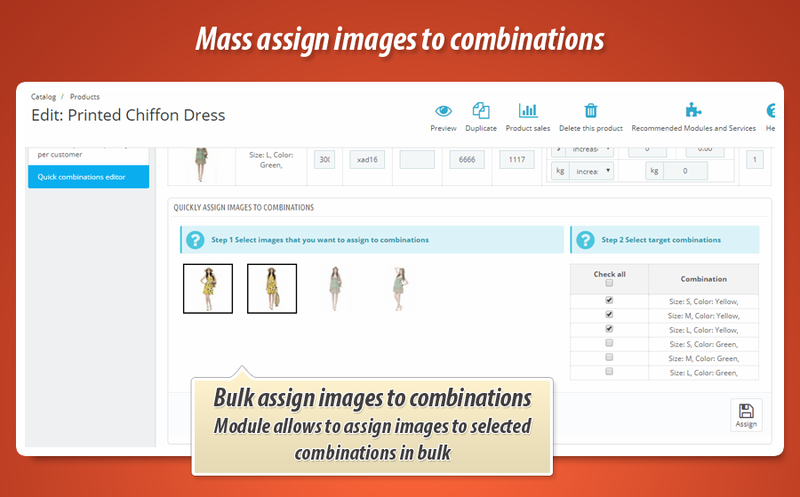 This mass attributes editor allows to quickly manage settings of combinations. 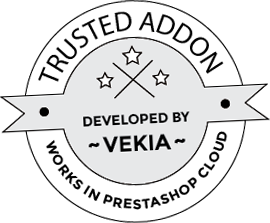 If you will use this addon in your shop it will create new menu item on each product edit page. 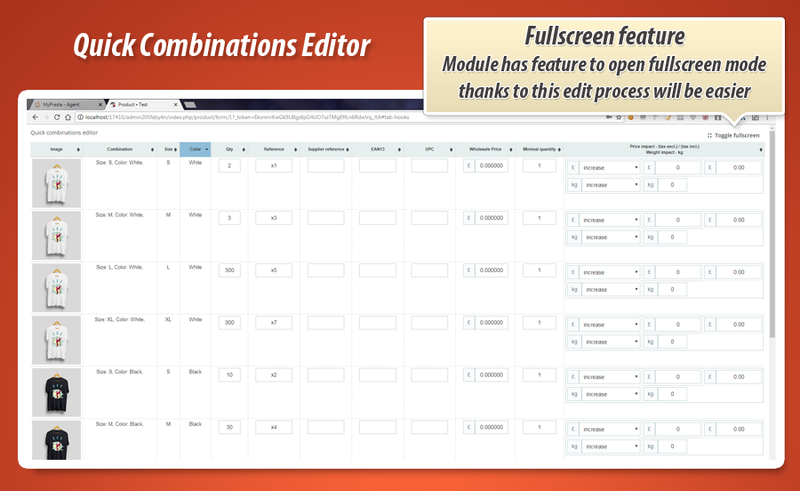 There you will find a list of available combinations with possibility to edit all of them from one page. Details about module features you can find below the image. 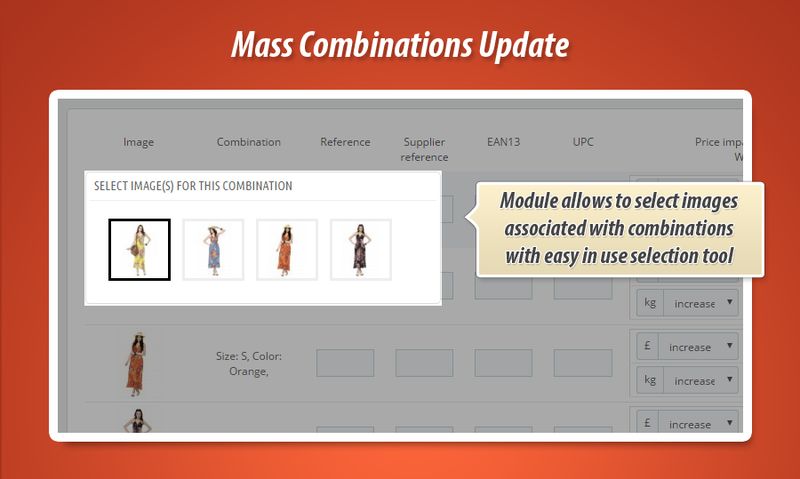 Main feature of this module is a new menu item on each product edit page, where you can quickly manage all product combinations. 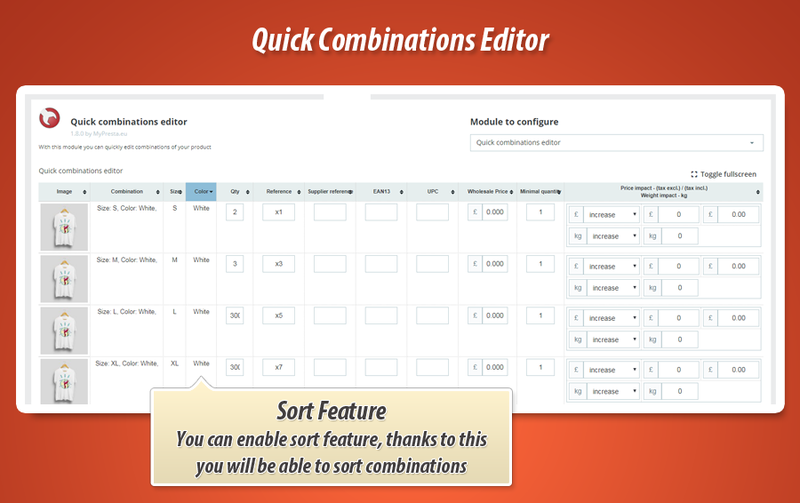 With this addon you can save a lot of time, you will not have to edit combinations one by one anymore. Below you can find list of available features. 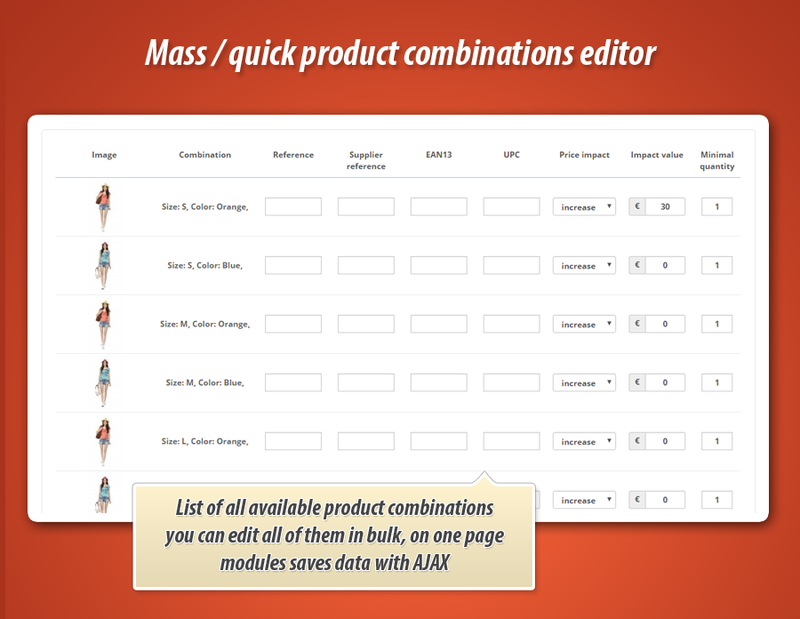 List of available combinations on one page On product edit page you can find a section that displays list of all available product combinations. This list of products contains several input boxes that allows to modify combination specification directly from this list. 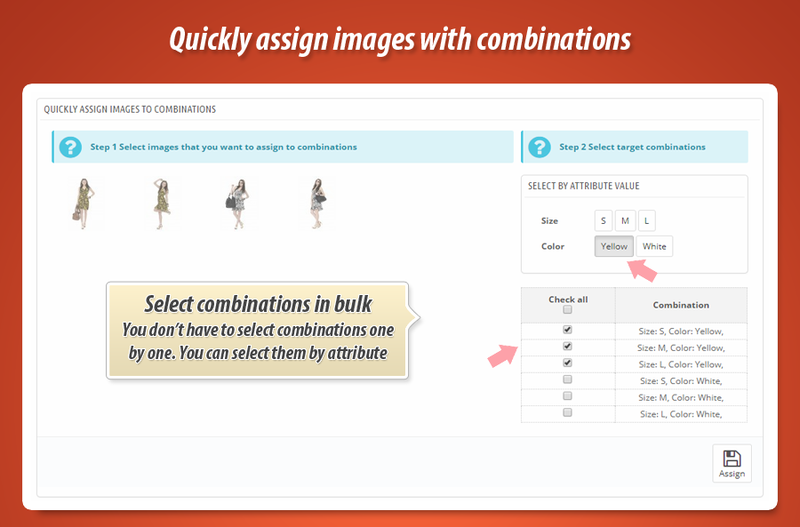 Image List of combinations display cover image of combination. This allows to identify the combination easily. Price impact Addon allows to quickly edit price impact method. 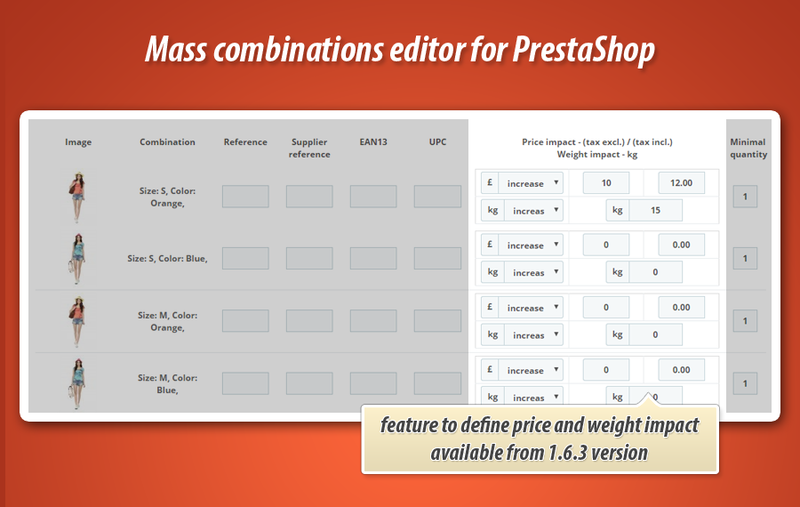 Combination feature in PrestaShop allows to define price impact on global product price. It can be increased or decreased. 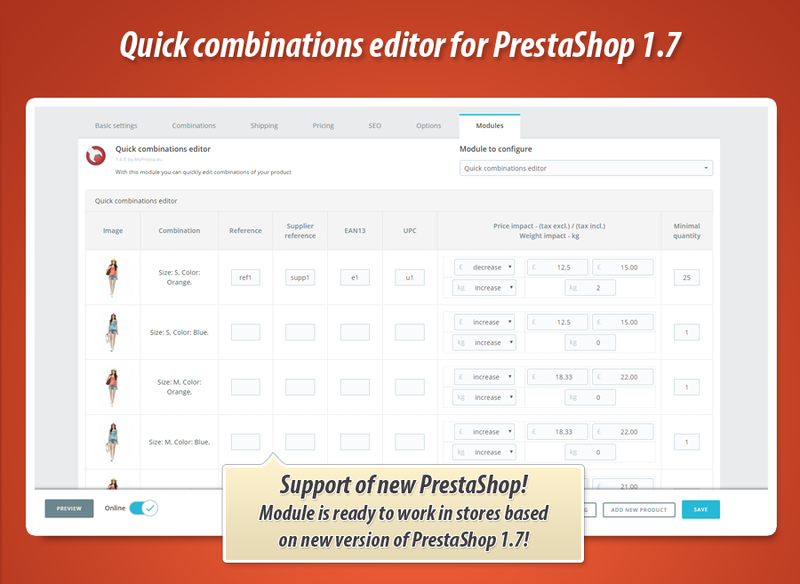 - module fully supports prestashop 1.7.x so you can use it in new prestashop! - added missed file qce.js that generated some problems. With this update file is included into the library, so everything works properly. This is link to back office of PrestaShop demo store. After login please go to catalog > products and edit selected product. 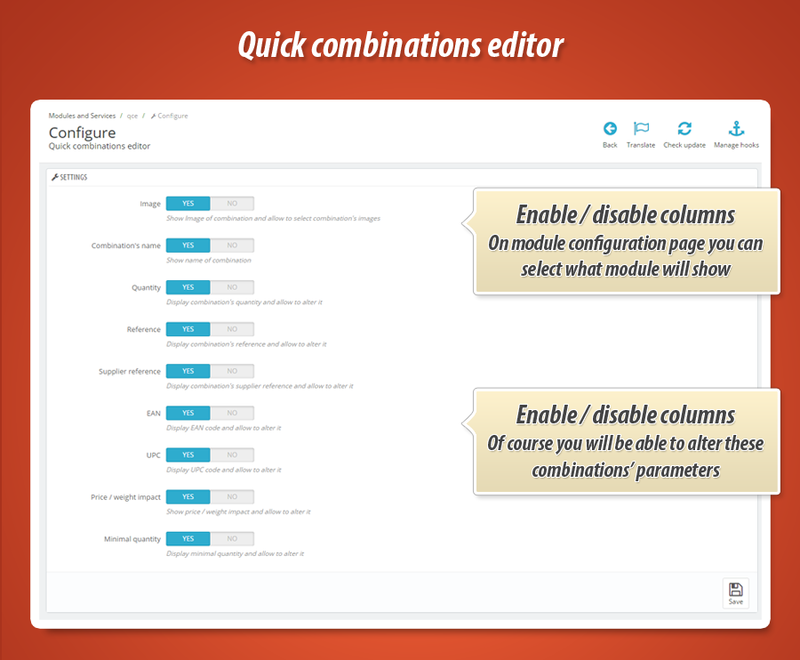 On product edit page you can find "quick combinations edit" section. Open it to quickly manage all combinations of product.